I ordered the Wolfcraft 4525404 Drill Guide Attachment for 1/4-Inch or 3/8-Inch Drills, so I could accurately drill 1” holes in a board for dowels used in bending wood. I needed the press to make the holes straight. The press came partially assembled. Not a problem to complete. Everything seems rugged, not quite as heavy as expected. The test was drilling a one inch hole in a 2 inch thick particle board to a depth of 1.5 inches. When using the press, it locks up. This is probably due to insufficient bearings for a job this size. Don’t press too hard. When the unit locks up, you have to grab it with some channel lock pliers and twist it till it frees up. This may mean taking the drill and the bit off. Not what I expected, and would not recommend it to a friend unless they are planning to drill smaller holes. I think 1” holes are a bit much for it. Kind of a shame if this is a bad product, I can think of dozens of times when this would have saved the day. Hopefully they get the kinks sorted out so I can buy one. I’m going to have a look and see if there is a place where I can lube it, but it looks like it’s just not up to the task of a 1” hole. It was being drilled in particle board, about 2 inches thick, which is pretty demanding. It would likely be okay for smaller stuff. What do the manufacturers recommend the largest drill bit size be to use on this rig ? I have the older style that the drill mounts directly into , versus attaching the drill to this second chuck spindle. Probably not as accurate (90*) as this model though. There doesn’t appear to be much of a bearing surface on the Wolfcraft model…probably intended for occasional use by a hobbiest that only owns a 1/4” or 3/8” hand drill. 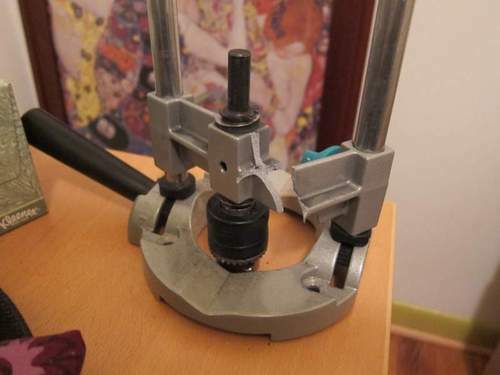 I got one like this and it is pretty much junk when you try to do angle drilling and the 90 deg just dosen’t seem to stay locked , I wish I could find an old porta-line unit like I used to have, they don’t do much for angles but they sure worked good for 90 deg stuff. I purchased an old Portalign rig from eBay for a few $ a while ago and it works great for what it’s intended to do. There’s one on-line now for 99 cents. I’ve attached mine to a 3/8” drill I had sitting around. Why spend the cash on a new Wolfcraft (that doesn’t work well) when you can get something more substantial on the cheap? I got my Grandfather’s old portalign jig and have used it on a variety of jobs. The thing works great and at a better price than what mountainaxe got his for: free. I just used it for boring holes in a couple of end tables. The top was to big to fit under a drill press since I was drilling in the exact middle and the portalign saved the day. It’s a simple well bit jig and I’m glad I got it.